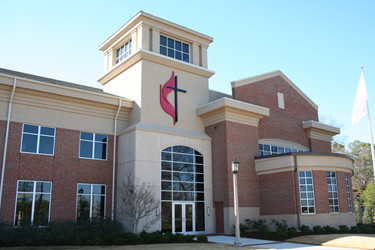 The United Methodist Center is located on the campus of Birmingham-Southern College. It houses the office of the Bishop and the North Alabama Conference staff plus three District offices. Birmingham-Southern College is located off US Interstate 20/59 at the Arkadelphia Road exit (123). To get to the United Methodist Center, take the road through the guard gate until it comes to a "T." Take a right at the "T" and then a right at the next stop sign. The United Methodist Center will be on your left. Parking is available behind the building. - From Exit 123, turn right onto Arkadelphia Road. - Birmingham-Southern College will be on the right as you top the hill. - From Exit 123, turn left onto Arkadelphia Road. - Drive over the interstate overpass - Birmingham-Southern College will be on the right as you top the hill.